Please call (800)826-6969 for registration information. $30- until November 23, 2018. $35- on race day November 24, 2018. Regulations – baby strollers, headphones, bicycles, dogs or skates will not be allowed on the course due to safety and insurance purposes. 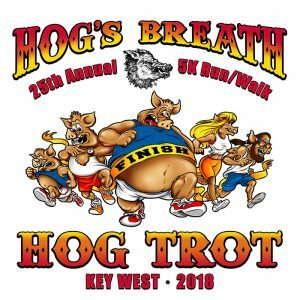 Package pickup: Pick up race package in front of the Hog’s Breath Saloon, 5PM to 7PM, Friday, November 23, 2018, or on the day of the race, Saturday, November 24, 2018, from 7am until the start of race (8am). AFTER THE RACE: Awards ceremony will take place at the Hog’s Breath Saloon. Lots of prizes to be raffled, and of course … free beer! (For participants only. Must be 21 or older with proper ID). THE RACE: The race begins at 8:00 am sharp on Saturday, November 24, 2018. Partial proceeds will help support the Florida Keys Community Pool. ENTRY FEE: Advance Registration $30 thru 11/23/2018, $35 on race day 11/24/2018. Make checks payable to: HOG’S BREATH SALOON.